Narelle here. On Saturday 25 May, Australians will have the opportunity to thank those who make a difference in their communities. Solicitors, barristers, judges and court officials. Young people under 30 showing leadership by example through acts of community service and leadership in local community and church organisations. Narelle here. Today I’m guest blogging on my friend Shirley Corder’s Writing to Inspire blog. In my post, Free books in Exchange for Reviews, I’m talking about the benefits of joining blog alliances for readers who review books. The post can be found at the following link. I’m a co-founder of the Australian Christian Readers Blog Alliance (ACRBA) and we are touring Shirley Corder’s book, Strength Renewed: Meditations for Your Journey Through Breast Cancer, on April 15 -19. • How to write engaging and effective blog posts to promote your work. • Writing a proposal to catch an editor’s attention. • Traditional publishing vs. self-publishing. COST: Early bird by 31st March $10, other $15, includes light lunch and morning tea. Cheques to be made payable to Australian Christian Writers Fellowship. Bank deposits possible on request. The National Day of Prayer and Fasting in Australia is scheduled for Sunday, February 10. The theme for 2013 will be LIFE and a Prayer Service will be held in the Great Hall of Parliament House, Canberra between 10am and 4pm. The National Day of Prayer and Fasting will be followed by 40 Days of Prayer and Fasting over the period of Lent from February 13 – March 24. In late December I start reflecting on the year that has gone and look forward to new challenges in the New Year. A definite highlight of 2012 was selling my debut contemporary inspirational romance book to Harlequin’s Heartsong Presents line in the USA. I’ll have more information to share on this sale in the New Year. 2013 will bring a couple of opportunities to travel. I’m looking forward to going to Sydney in April to present a writing seminar hosted by Australian Christian Writers Fellowship. I grew up in Sydney and the book I sold to Harlequin is set in Sydney. The writing seminar details are below. Get ready, get set and GO! 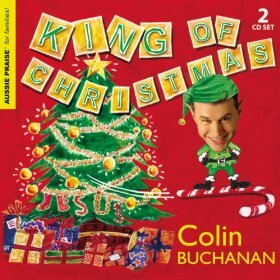 Here comes Colin’s amazing Christmas album – King of Christmas! Colin follows up his best-selling “Jesus Rocks The World” with this rip-roaring collection of new songs celebrating the joy and wonder of the birth of God’s own Son, King Jesus. With the songs like the uplifting “Happy Happy Day”, the rocking “Merry Merry Christmas”, the funky techno “Glory to God in the Highest” and the rumpty tumpty “The Greatest Christmas Gift” (featuring guest vocalist and ventriloquist puppet, Martin Clifford), Colin retells the story of the first Christmas with biblical faithfulness and an irrepressible sense of fun. Narelle: For a number of years, King of Christmas has been a favourite Christmas CD in my house. My kids have enjoyed singing along to “Jesus Saves! Jesus Saves!” (tune of Jingle Bells), “On That Very First Christmas” and “Merry Merry Christmas”. The songs have Colin’s distinctive Aussie style, with catchy tunes that will help children focus on Jesus’ birth as the true meaning of Christmas. I highly recommend King of Christmas if you are looking for a fun and contemporary Christmas album with a Biblical message that will engage children of all ages. More information can be found at Koorong and Word (Aussie Christian Retailers).